FEI Titan Krios#1 transmission electron microscope (TEM) is equipped with a Gatan K2 and a Falcon 3 camera. FEI Titan Krios#2 TEM is equipped with a Cs corrector, a Volta phase plate, Falcon 3 camera and a Gatan BioQuantum energy filter that uses a K2 camera. FEI Titan Krios#3 TEM is equipped with a Volta phase plate, Falcon 3 camera and a Gatan BioQuantum energy filter that uses a K2 camera. FEI TF20 TEM is equipped with Direct Electron DE20 and TVIPS F416 cameras. Two side entry cold stages are available for use with this microscope. FEI Biotwin TEM has a TVIPS F416 camera. This instrument will be primarily used for screening vitrified samples. JEOL1230 TEM is equipped with a Gatan Ultrascan camera. This microscope is primarily used for screening for negative stain samples. FEI Helios Focused Ion Beam- Scanning Electron Microscope (FIB-SEM) is equipped with a Quorum Technologies cryo preparation system and a Gatan Omniprobe that is designed for lift out at room temperature. Nikon Eclipse Ti-U light microscope is equipped with a 130w Hg Illuminator with Epi-Fluorescence Module and a Photometrics HQ2 Digital Camera. The microscope has a custom stage to accommodate the FEI Cryo Stage2 System. Specimen preparation equipment includes Carbon Evaporators (Leica ACE 600 Carbon Coater, Cressington 208, Edwards), Gatan Solarus Plasma Cleaner, High Pressure Freezers (Bal-Tec HPM 010, Wohlwend HPF Compact 01), Leica EM UC6 Ultramicrotome, Plunge Freezers (FEI Vitrobot, Gatan CP3 and manual plunge Freezers), Scienion sciFlexArrayer liquid handling system, BioRad NGC FPLC with fraction collector, NanoDrop for UV-Vis measurements, various centrifuges and other sample preparation equipment. “SEMC Server”: DDN Storage’s GRIDScaler GS7K appliance with 725TB GPFS parallel file system, 40 SuperMicro nodes for HPC cluster each with 24 CPU cores and 256GB RAM, 4 GPU nodes with Nvidia K40 GPU and 128GB RAM, 5-36 QSPF port 56GB FDR InfiniBand switches, Bright Cluster Management. “Goby server”: Dell PowerEdge R710 node that provides access to 16 cluster nodes below Dell PowerEdge M1000e – 16 nodes with two 4 core processors and 48 GB of memory/node. A 10Gbps network with a 40Gbps backbone connects all of the microscopes, major workstations and servers. A separate HVAC and building chilled water system for the TEM rooms is currently being installed. This system is designed to maintain the temperature within the rooms to within +/-2°F and keep humidity to under 20%. 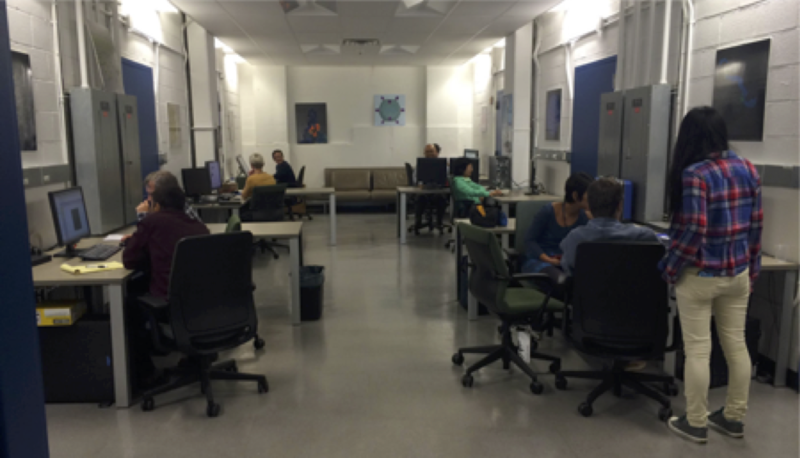 All of the Krios rooms have active vibration control tables on which the microscope column sits to ensure against any future building activities in the area as well as active magnetic field compensation systems. The TEM rooms directly connected a large “control room” that acts as a central area for users of the instruments and for working on data processing, and analysis. The instruments are conveniently controlled using Leginon operating on computers in the control room leaving the microscope rooms undisturbed by human activity and also providing a pleasant collegial atmosphere for users collecting data over long hours.